WELCOME to the web pages of the Danube Swabian village of HRASTOVAC, also known under its German name of EICHENDORF. Hrastovac was a thriving village during the period of its original ethnic German inhabitants and deserves to have its memory kept alive. Hrastovac was established in 1865 by the sons and daughters of the Danube Swabian settlers in the Swabian Turkey, the counties of Baranya, Somogy and Tolna in what is today Hungary but back in 1865 was still the AUSTRIAN EMPIRE, which two years later became AUSTRO-HUNGARY. Those were Danube Swabian descendants of the brave Pioneers who arrived after the Ottoman Empire (Turks) were expelled from the Pannonian Plains in 1688 from diverse Germanic areas and transformed the swamps, deserts and thick forest they found into the bread basket of Western Europe. 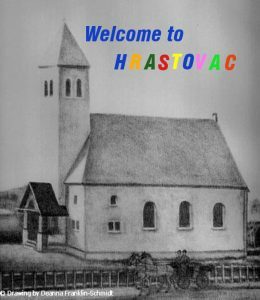 Their descendants spread as of 1865 south of the River Drava into Slavonia and established what later became the vibrant village of Hrastovac and many of its surrounding communities. All that ended in 1944 when who could did flee ahead of the approaching Red Army and others became victims of Tito’s Partisans atrocities. Today the Hrastovacers and their descendants are living in all the corners of the world. Their history and the history of their ancestors are collected here for you.